Question: I just bought my house and the kitchen really needs to be remodeled. The problem is, every wall in this cube has a door, doorway or a window. And the window is too low to put a counter in front of. I do have a table right now in front of the window, but I can’t open the refrigerator or my baker’s rack all the way. This was a cottage built near the beginning of the 20th century, and I don’t think the kitchen was made to entertain. Answer: Like any remodeling project, you’ll first have to ask yourself what you’re willing to spend. The doors, hallways and long window all pose problems, and the best ways to make this kitchen more functional and entertaining-friendly involve structural changes, which can become expensive in a hurry. If cost isn’t a big concern, consider eliminating the bathroom entrance into the kitchen. “Moving the hallway entrance to the kitchen down to the opposite end,” she adds, would give you the “L” kitchen shape, and you could put a table in the corner. 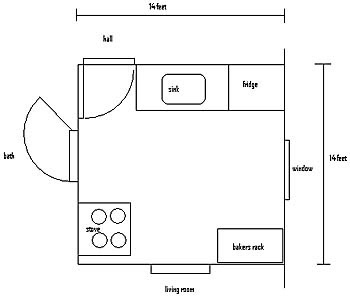 If the hallway entrance cannot be shifted, Kenney suggests moving the living room entrance to the stove’s current location to create another common kitchen layout. “[Moving the living room entrance] would give you the opportunity to create a “U”-shaped kitchen opposite the bathroom, and keep the traffic flow out of the working area of the kitchen,” she says. If your goal is to make the space feel less boxed in, consider creating an open floor plan by knocking down the wall separating the kitchen and the living room. In this scenario, you could also add an island with a range in front of the sink, eliminating the need for a stove near the living room. 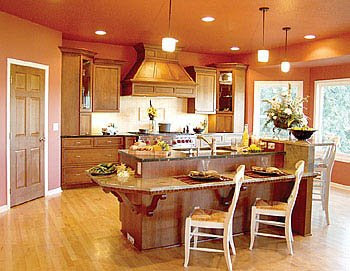 Just remember that NKBA planning guidelines call for the island to be at least 42 inches from the front of the sink.. Even if structural changes are out of your budget (or if they will compromise the integrity of the home), an island behind the sink could still increase the functionality of your kitchen. It could either serve as a space for your range, or it could be used as a work station and a table. A two-tiered island can help you create separation between the cook’s space and the guest’s space. While this plan eliminates a traditional table from the room, the island seating area still allows you to entertain. Finally i searched the blog, for what i was searching for many days.Actually i am thinking of remodeling my small kitchen. So, thanks a lot for this lovely blog. Nice renovation. Thats called small but luxurious Kitchen design, Which I have ever want. Walnut and golden wood is mine favorites cabinets. Even I have also furnished my house with this cabinets couple of months ago. Good to share such a magnetic design.